Just a heads up, this post is a long one! Restaurant Week gives Las Vegas locals an opportunity to experience fine dining while also giving back. 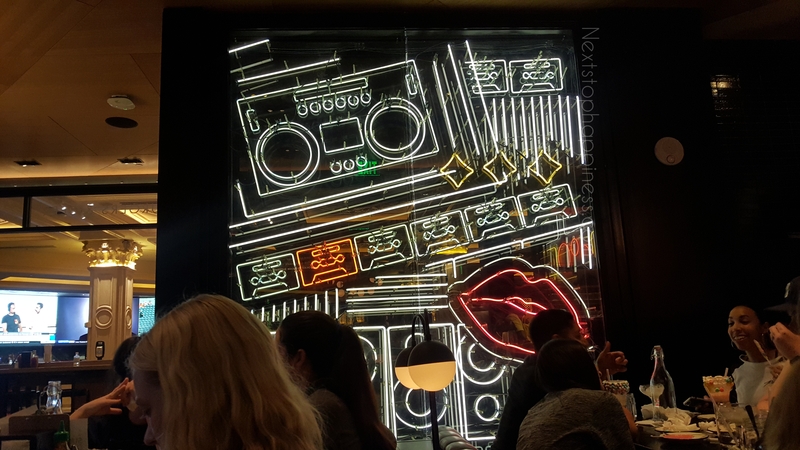 A few restaurants within the Las Vegas Valley create set menus for guest to experience and a portion of the set menu price is donated towards Three Square. Three Square is a member of Feeding America; Three Square is a local food bank in Southern Nevada that provides food assistant to families in need. Black Tap was one of the restaurants that was listed in the very long list of restaurants that were participating during the week. I’ve been meaning to try Black Tap for a long time. Some of my friends and guests at my job have told me reviews about their burgers and their shakes and how it was definitely a must try. Black Tap is located north of Las Vegas Blvd, inside the Venetian. 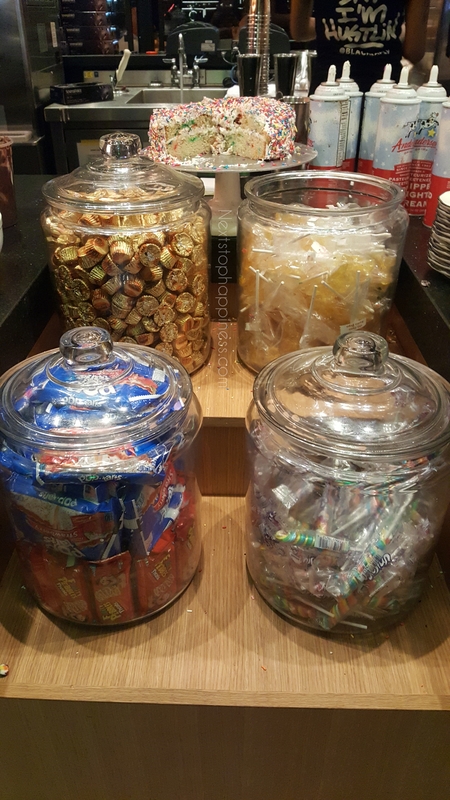 Once inside the casino, you’ll find this sweet concoction towards the edge of the hotel. The location is very convenient if you really like people watching as they do have indoor and outdoor seating. 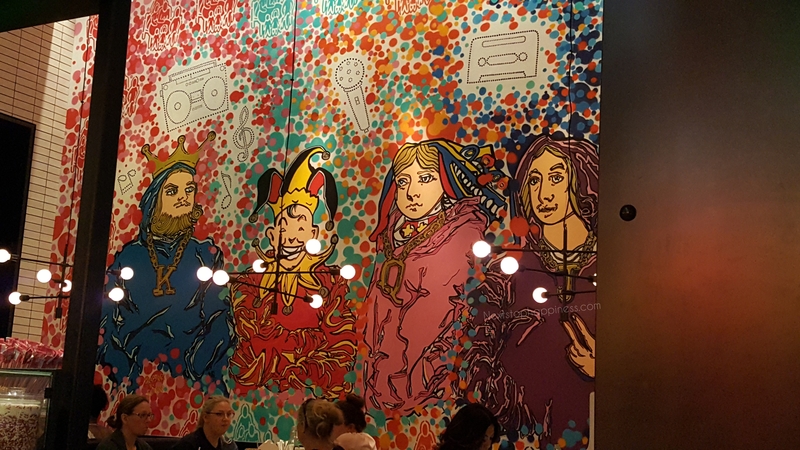 If you choose to sit inside, you do get the opportunity to see the hustle and bustle of the restaurant, the sweet aroma of shakes being made and awesome art along the walls. Each room inside the restaurant had a different art piece leaving each guest to experience a different view as to where they sat. They also created a different vibe by playing old school hip hop inside and outside of its walls. I also thought it was neat that all their colleagues were wearing uniforms which included a lyric to a hip hop song on the back of their shirts. Our server Dom was very attentive and was very accommodating towards our order. 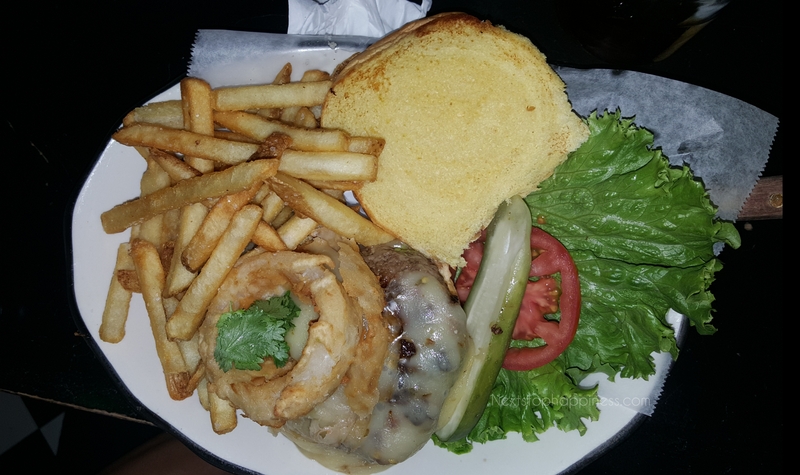 Their menu for Restaurant week included a starter, a choice of a burger and one of their shakes. Dan also said that we can upgrade our shake to one of their Crazy Shakes. Once he told us that, we had to take on the opportunity to try. For their starters, we had a choice between their ‘Fried Mozz’ which is their version of Fried Mozzarella or Fried Pickles. It was only right for us to actually order one of each. Their Fried Pickles were, of course, deliciously sour and was seasoned lightly with salt. Each pickle didn’t have a consistent crunch so if you’re looking for a tempura version of this dish, you’re not going to get it here. The Fried Mozz was just like any other Fried Mozzarella dish. However, I would like to say their Smokey Chipotle Tomato Sauce set the tone. Not only was it perfectly spiced, there was also a very subtle hint of sweet and sour. The consistency was very creamy and wasn’t thick like other tomato sauces that come with Fried Mozzarella. I was even dipping my Fried Pickles in this sauce; it was that delicious. The two burgers that we ordered were The Mexico City and The All American Classic. 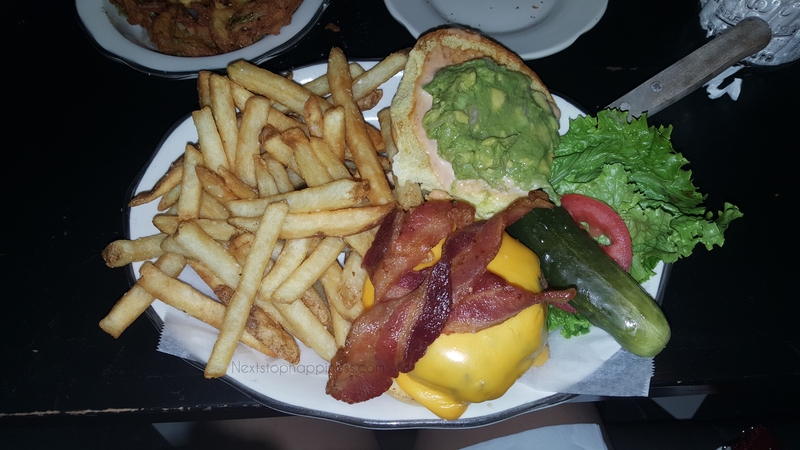 I of course stuck to the classic and added bacon and avocado on to my burger (YES I AM THAT PERSON! NO SHAME!). All the burgers come with their french fries that are lightly salted. The burger sizes were just right, the beef patty was thick, but sized just perfectly with a familiar taste of salt and pepper. As all burgers should be (in my honest opinion), I asked for my meat to be cooked medium and got just that. My first bite of my burger was a bit messy due to the guacamole. But the first bite was mouthwatering that it made me crave for the taste even more. The charred flavor of the meat along with the familiar pungent taste of cheese brought me back to a classic backyard BBQ that you always had during the summer. As our last course, Dan suggested we should try out of their Crazy Shakes because it’s what most guest turn to when they come into dine. Before going in, I did a little research on how big these so called Crazy Shakes were. In photos, they do not look that big, but in real life, that’s a different story. In the middle of the restaurant, they have colleagues making their sweet concoctions. I asked one of them if they use all the ingredients that were on display. 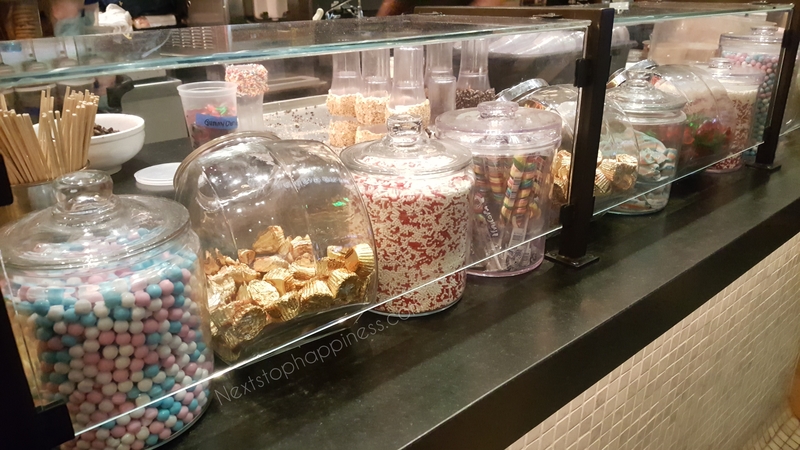 They then told me both yes and no; that some of the candy used to be components of their old Crazy Shake Menu. It then made me curious and wondered if they had a secret menu. I unfortunately had no time to ask due to having my Crazy Shake being brought to me. Needless to say, it was indeed a Crazy Shake. This thing was huge! We ordered the Cookies ‘n Cream Supreme and The Cake Shake. They were not shy with all their ingredients and they weren’t kidding when it came to the sugar high. 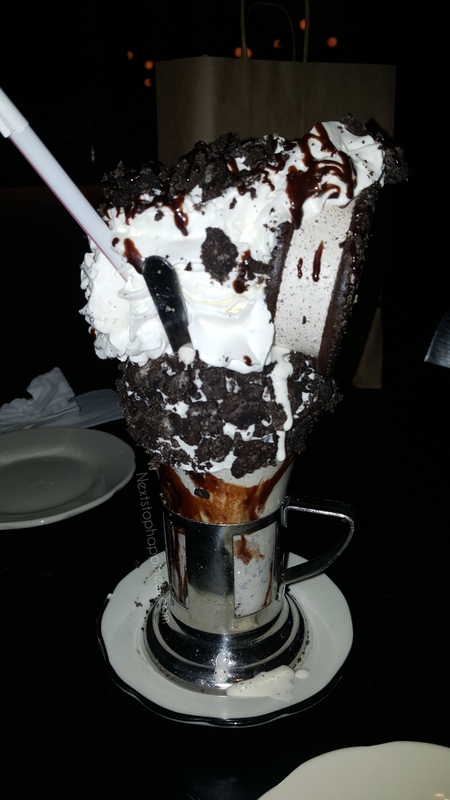 The Cookies N Cream came with an Ice Cream Sandwich and a vast amount of Oreo and Chocolate Syrup. To be quite honest, I’m not really a fan of chocolate but I did have a bite and this for sure was enough chocolate for me for the rest of the year. 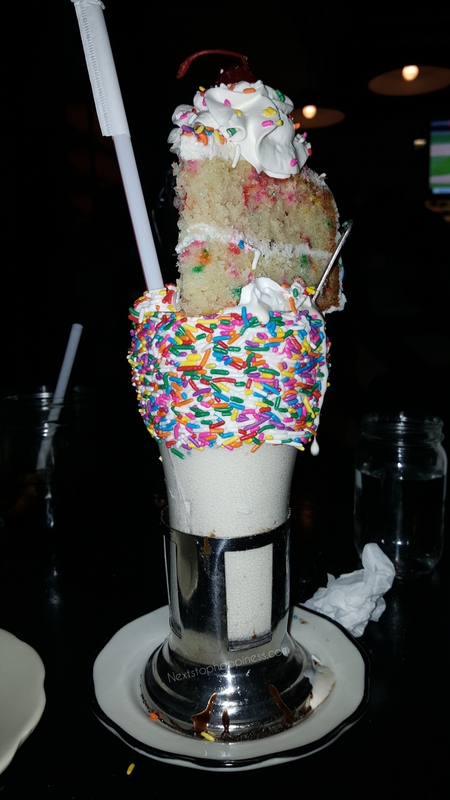 The Cake Shake was a mixture of Vanilla Ice Cream and well Birthday cake. My first sip took me by surprise because the texture of the cake batter. It really wasn’t the cake batter itself, but it was mushed cake and the Vanilla Ice Cream. The cake on top was sweet and very fluffy after the first chew. Afterwards, I convinced myself to dip the cake inside the shake so I can skip the chewing part. Gluttony at its finest; again no shame at all! At the end of the dinner, we decided to donate a little more to the charity and of course that has never been done before because the set menus are priced for a certain donation that goes towards Three Square. Josh L., who is their General Manager, was very helpful and accommodating towards this request and we can’t be thankful enough. Our expectations were for sure met and we will be returning very soon to try more of their menu.